In 1972, North Korea was richer than South Korea with their vast natural resources. They still have them. They have been ruined by the Communist. So if you go there, open a mine, silver, coal, iron ore, there are plenty of things you can do there. I did meet with people in the Government and they offer you all sort of incentives. It is going to be the most exciting country in the world when reunification comes. You are going to have a country of 75 million people right on the Chinese border, vast natural resources in the North, huge amounts of cheap and disciplined labor in the North. In the South you have lots of capital, lots of management ability. It is going to be unbelievably exciting! The Swiss Franc is just less bad than the Euro, the Swiss Franc is less bad than some other currencies, at this point. People are looking for a sound place to put their money. There aren`t any sound paper money anymore, so they have to look for the one that is the least bad. The Swiss Franc is one of the less bad. They have been trying to slow things down, they had inflation, they had a property bubble and the government is rightly trying to slow things down.Sme of their customers are slowing down, Europe, etcetera. So, yes, things are changing in China, they have been slowing down. I have been buying Chinese shares for the past year. I did not buy Chinese stocks between 2008 and 2013. But the government came down with a list of the parts of the Chinese economy they are going to emphasize, where they are going to billions of dollars emphasizing these parts of the economy. So I have been buying shares in those sectors of the Chinese economy. The Japanese stock market is down 60 percent from its all time highs. The U.S. stock market is making all time highs. The Japanese stock market is certainly cheaper on an historical basis, on an absolute basis, on a relative basis. You have to be worried about the currency. You have to understand the currency because it is being destroyed. But if you hedge your positions, you might make some money. Debasing your currency has never been a viable way to revive a country, even in the medium term. It helps in the short term but its a disaster in the long term. So, Mr.Abe, the prime minister will go down in history as the person who ruined Japan. No question about that. In the meantime, I own Japanese shares, I will probably buy more. He is putting through things that have helped and will help the stock market. Giving incentives to the Japanese to buy shares, he is persuading the pension funds to stop buying government bonds and to buy shares. He is doing a lot to help the stock market. But I want to emphasize, in the end it is going to be a nightmare for Japan but in the mean time its good for stock brokers. In the energy markets, what is happening there, its a political situation that is taking place. Unfortunately, when they bankrupt a few producers, such as the fracking companies, I am afraid oil is going to go much, much higher. 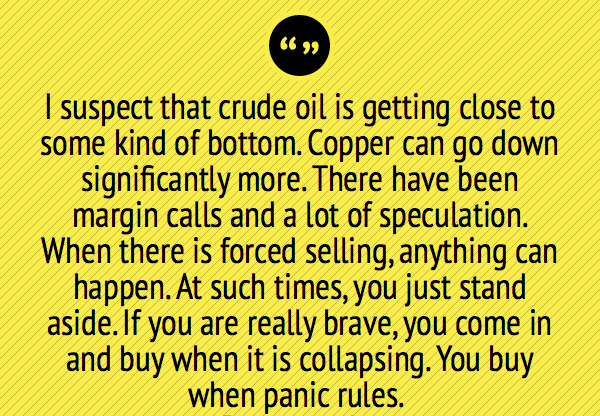 I don`t know if this commodities bull market is over, I happen to think it is not. But we are having a major correction , which is normal in markets. That is the way markets have always worked. I do not see enough permanent supply in most commodities, except maybe in iron ore and a couple of other commodities. I don`t see enough permanent supply to end the bull market unless we are going to have an economic collapse. We could and will eventually. 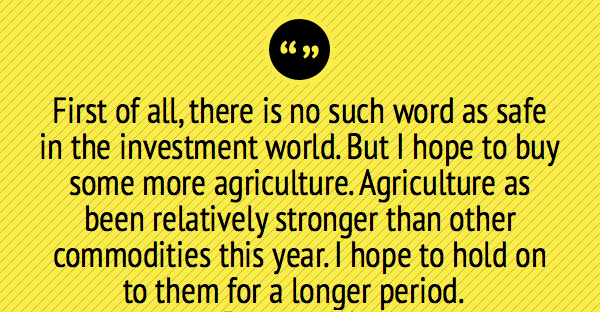 I am especially optimistic about agriculture at the moment. If things are collapsing you should be looking that way, not running away. So I am looking to increase my investments in Russia.